The Cuisinart SM-70 7-Quart Stand Mixer is a serious mixer for serious bakers: It has twelve different speeds tailored precisely to different jobs and three power outlets for dozens of attachments that allow you to mix, whip or knead your bread, cake and cookie dough to your hearts content. It comes with three attachments as standard (a whisk, a paddle and a dough hook), with many more available to purchase through the company’s website. It also has a splash guard, so it wont throw your cake mix all over the kitchen walls, and a pouring spout for easy transfer from the massive mixing bowl to a baking dish or work surface. The bowl itself is easily removable from the main body of the mixer due to the lever-released, tilt-back head which also makes it easy to switch attachments, remove them for cleaning or just check on your dough. The mixer comes in three different, neutral colours, to suit any style of kitchen – as long as you have the counter-space for this monster! I once had a mixer that broke on the same day Id promised my parents Id make a big batch of brownies for them so I had to spend my day trying to cream butter and sugar together by hand. How hard can it be? I thought. People in the good old days must have done it all the time. It turns out, creaming butter is hard. Bakers in the good old days must have had arms like tree trunks or just lots of people around willing to take over when they got tired out. Whats more I live in London, UK, and it was December so the butter was hard even at whatever passes for room temperature on this windswept, rainy island in the mid-winter. By the time I was done, I could barely lift the finished brownies to my mouth due to the excessive arm cramp and had to be spoon fed like a baby. Hey, at least I got brownies. But that’s the thing about the good old days: There’s a reason we moved on. And we moved on to things like Cuisinarts SM-70 mixer. At 25.5lbs (11.5 kilos), its a hefty piece of kit but that’s basically okay: I once had a mixer that was so light that it would walk itself off the kitchen counter when you turned it to high speeds. This one aint going nowhere. Seriously, it takes two people to lift it. Anyway, it has to be pretty huge to contain all the different features and accessories: If you buy the extra attachments, there’s very little it cant do. The price tags as hefty as the mixer and the extra attachments don’t come cheap either. Whatever reservations you may have about the price, the SM-70 does the job. And if you do buy the attachments, you can go beyond baking to blending and juicing – even making your own pasta, sausages (which Ive always wanted to try!) or mincemeat. Plus, youll never get cramp from creaming butter again (unless thats how you like to work out. I think Ill stick to the gym, though). 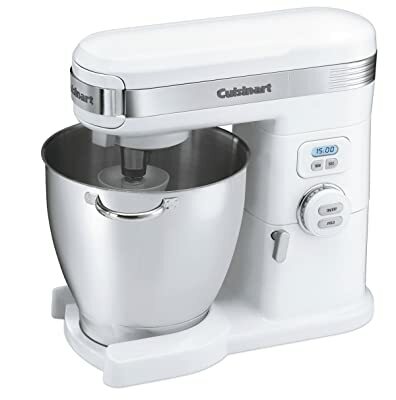 You can buy a Cuisinart SM-70 7-Quart Mixer from most big retailers or hunt for a bargain online – there are used models out there and the solid construction (25.5lbs!) and tough, wipe-clean surfaces suggest it’ll last for a long time. If youre looking for versatile mixer, you cant go far wrong with the SM-70.